Read what some of our customers have said about the outstanding service they received from REI. 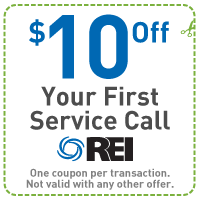 I have and continue to use REI for all of my heating, air conditioning and refrigeration installation and maintenance needs. I've never been disappointed in their service or charges. Absolute Engineering Group, div. of Ahimsa Technic, Inc.
REI has installed two units for us. One in our personal home and another in an investment house. They did a great job on both houses. Their prices were the best in town, there work was clean and we have had no issue with either system. Would definetly use them again. If you are looking for a firm that provides great customer service, shows up when they say they will, is honest and fairly priced, then REI and Robbie Isaak are the ones to contact. I’ve used Robbie for my home HVAC system, as well as a rental property, and he’s always been there to solve the problem. He is very knowledgeable in pretty much all HVAC systems, old and new, and does a great job at a reasonable price. He’s honest, tells it like it is, and is very fair, quite unusual these days. We would recommend Robbie Isaak @ REI Air Conditioning and Heating, Inc. to anyone needing a honest hard working AC man. We have never been disappointed with his work or the invoice. Robbie is always on time and reliable. He rebuilt a unit that a highly advertised local company said could not be fixed and saved us a ton of money before I had finished my first cup of coffee. With the economy the way it is, saving every dollar possible is as important as the quality of the work being done and again I would highly recommend REI Air conditioning to anyone looking for high quality work at a reasonable price. We became aware of REI’s reputation for high quality work through friends where they had serviced and repaired a/c equipment at both commercial and residential locations in Lake Mary. When one of our own heat pumps failed last year, REI attempted to fix it, but the 25 year old unit was beyond economical repair. Although the installation of our new unit was complex, and REI spent considerable additional time in fine tuning it, there was never an add on or extra charge to the contract. A few months later, when another 25 year old heat pump failed, we immediately called REI and told them to replace it. We were so confident of their demonstrated performance, that we didn’t even seek a second bid. Robbie Isaak has been extremely helpful with all our a.c./ heat and duct work needs.. We are impressed with his conscientious work ethic and reliability. Robbie has consistently pointed out ways we can improve our air conditioning and duct work performance. It has always been a pleasure having Robbie work for us. Just wish there were more repair personnel out there of his caliber. Robbie installed our AC/heating unit in our new home and took it upon himself to also put in our dryer vent as well as rerunning a drain pipe for our new home. Happy with the entire REI experience. I definitely don't like the feeling of seeing my thermostat creep upward in the summer, but I do love the feeling that I know just the people to call. One call to REI and I know it's taken care of. A lot of times service people will try to charge more in our neighborhood just because we can "afford" it, but I can trust Robbie to be completely honest and fair with me. Robbie Isaak of REI Air Conditioning upgraded all three of the a/c units in my home. He installed a computer controlled, complicated new technology that works like a charm. The system is wonderfully economical to run, certainly far more economical than the three prior units. I am very pleased with his work product, his equipment choices, his cleanliness and his technical skills. A good job, well done. I do not think I will be needing to replace this new equipment for a while, but I highly recommend this company, with a clear conscience, to any other homeowner in our area.